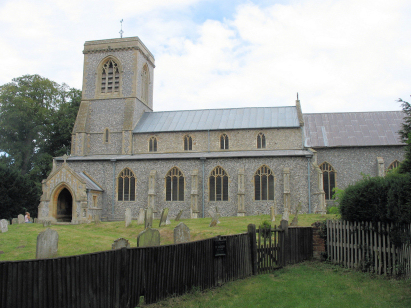 The parish of Blickling lies in northeastern Norfolk about 2 miles northwest of the market town of Aylsham. The parish is dominated by Blickling Hall, one of the major Jacobean houses of England, the home of the Hobart family and irrevocably associated with Anne Boleyn. There is little in the way of a village at Blickling, just a scattering of farms and cottages other than the vast parkland estates of the Hall. What passes for a village centre is sited on a lane which heads northwestwards from Aylsham towards the B1149 at Saxthorpe. The parish is situated in the valley of the River Bure, a tributary of which has been utilised in the parkland to create the feature lake which dominates views from the house. St Andrew's church sits on a bend in the above described lane close by the entrance to the main driveway of the house. The church and estate were clearly much intertwined during the period of this transcript. The parish was dominated by a single land owner and population restricted accordingly. St Andrew's church appears from the exterior to be a relatively modern (Victorian) piece but under this facade lies a much older building. 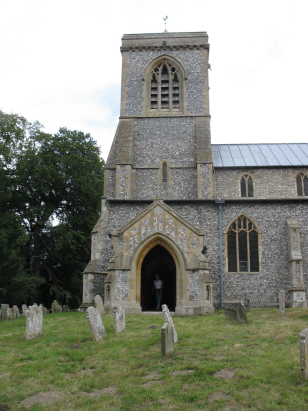 Much is Perpendicular, as you would expect in Norfolk, but earlier work is present back to the south doorway which is Early English and places the origins back to the early 13th century. A single standard 800-entry register covers the period of this transcript and runs to 1897. This register is filmed on Microfiche 6 & 7 in the collection of the Norfolk Record Office and was used to prepare this transcript. The fiche are, unfortunately, rather elderly and suffer from the poor image quality which could be achieved when filmed. The images are pale and lack contrast and often are faded to almost unreadable. Fortunately images are present for this register on the Familysearch web-site and these are of a superior quality thanks to the features of Photoshop. As a result a readable image was always available making for a straightforward transcript to prepare, it is hoped few errors will have crept into its production.